Since I am mostly a Martin guy, not a lot of Taylor guitars come through my studio, but every one I have played has been very nice, and the T5z Custom Koa is no exception. In fact, this is the nicest, easiest playing, and most versatile Taylor I have played to date. The Taylor T5 guitars have been around for years, and they were the first really good production guitars that could be effectively played as an acoustic or an electric. And I do not mean just as an amplified acoustic guitar, either. You can play acoustic country and then plug and then plug it into a tube amp and get an incredible overdriven tone. The T5z take this same design and presents it with a narrower body, heavier frets, and a 12-inch fretboard radius, which makes it play a bit more like a traditional electric guitar. The Custom is the top of the line (there are four models), and it comes with a beautiful AA figured Koa top. The T5z is a good-looking guitar, and is chock full of high-quality components. 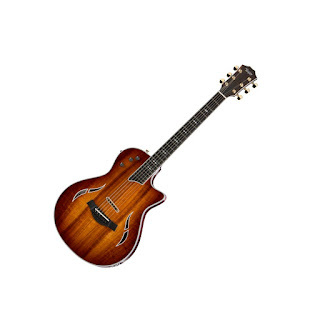 There is five-ply binding on the Sapele body, and single-ply binding on the soundholes, pickup cavity, fretboard, and headstock. Though not my favorite look, the gold tuners, pickup cover, and strap buttons (two on the bottom!) do look pretty cool. The neck is killer, and its 24 7/8-inch is a good compromise between electric and acoustic guitars. The neck itself is Sapele with an Ebony board, and there are 21 jumbo frets sunk into it. It plays a lot like my Les Paul, and though I am not a fan of glossy neck finishes, this one is not terribly sticky. There is a bone nut, which matches up nicely with the bone bridge saddle. All of these parts are stuck together well, and the craftsmen at Taylor did a wonderful job of building this instrument. The frets are perfect, the poly finish is flawless, and I could not find a single thing to complain about, which is a rarity. The set-up out of the box was perfect, and despite its smaller body size, it has a great organic tone and surprising volume when it is unplugged. When plugged in, this guitar can be a completely different animal. It does a good job with the usual amplified acoustic guitar sounds, but when pushed it can attain a true Les Paul crunch. This is thanks to the T5 electronics package, which includes three pickups: an underbridge acoustic body sensor, a concealed neck humbucker, and a visible bridge stacked humbucker. A five-way switch, one volume knob, and two tone controls control these pickups. I ran the T5z through its paces with my Twin Reverb and my Fender Acoustasonic, and the folks at Taylor have truly done some magic with this design. It is a perfect hybrid of acoustic and electric, and if you could only have one guitar to do everything, this would have to be one of the best choices. It can sound like a Les Paul or a Strat (not such an accurate Tele sound though), and does a very good acoustic sound too. As an added bonus, it only weighs 5 pounds, 14 ounces, which is about half of what my log of a Les Paul. As I said, the Taylor T5z is an incredible guitar, but you are going to pay dearly for all of this awesomeness. The list price on this guitar is $3798 with a street price of $2999 (which includes a really nice hard case). This is a lot of money and there is a lot of beautiful instruments at this price point. But, it holds it own, and should definitely be on your list if you are in the market for a versatile acoustic/electric guitar.